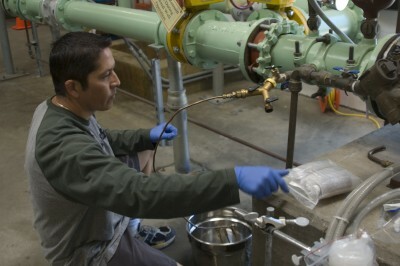 USGS scientist sampling a public-supply well in California. Photo credit: Cathy Munday, USGS. 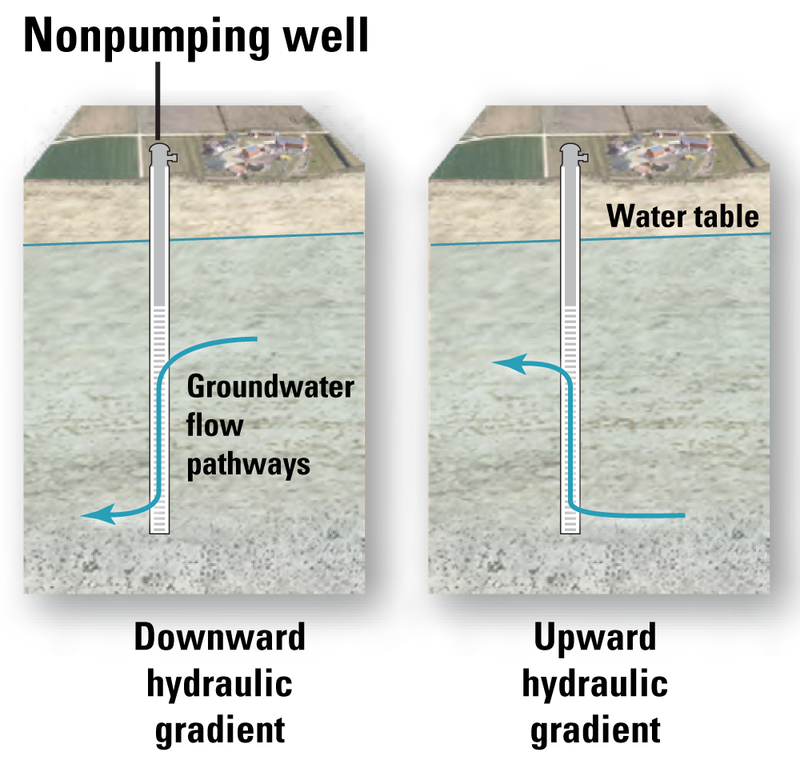 An idle (nonpumping) well with a screen that is long enough to intersect different parts of an aquifer having different hydraulic heads will allow water and contaminants to migrate from one location within the aquifer to another by way of the wellbore. The movement can be downward or upward, depending on the direction of the hydraulic gradient, and can expand the volume of aquifer containing contaminated water that flows to the well when it is pumped. Modified from p. 63, USGS Circular 1385. U.S. Geological Survey (USGS) scientists studying the vulnerability of public-supply wells to contamination have identified ways in which the seasonal operation of public-supply wells can affect the quality of water that they produce. By incorporating historical water-quality data into models of fluid flow, USGS scientists were able to estimate the amount of contaminated groundwater reaching a supply well under various seasonal conditions. Model simulations demonstrate that changes to the period of time that supply wells are pumped during different seasons of the year could decrease contaminant concentrations in water that the wells produce. In many areas, seasonal changes in water demand result in wells used for public supply being pumped more often and for longer periods of time during the summer than during the winter. Examples of such areas are Modesto, California, and Albuquerque, New Mexico, where many public-supply wells produce water from multiple depth intervals that can differ substantially in water quality. Analysis of historical water-quality samples from public-supply wells in Modesto (134 wells) and Albuquerque (95 wells) indicates that the wells are more likely to produce groundwater with higher concentrations of certain contaminants (nitrate, uranium, or arsenic) during one season relative to the other season. By incorporating new and existing data, scientists used statistical analysis, mathematical mixing models, and groundwater flow and transport models to identify primary factors that result in the seasonal water-quality patterns observed for the Modesto and Albuquerque supply wells. They identified two main processes that are related to pumping stresses. One process reflects the effect of summer pumping on water levels that control the vertical and horizontal flow of groundwater through the aquifer to supply wells. The alteration of water levels results in depth intervals of the aquifer with higher contaminant concentrations contributing more contaminated water to wells during one season relative to the other. The other process reflects the period of time that a supply well is idle. 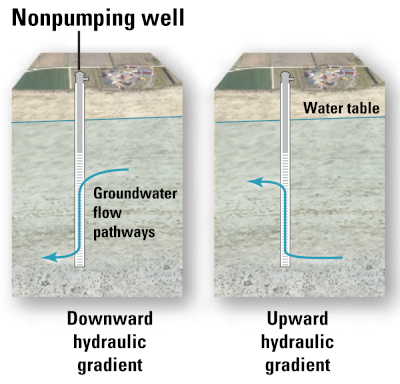 When a well is not pumping, its wellbore can act as a conduit for vertical groundwater flow from one interval of the aquifer to previously uncontaminated intervals, thus expanding the volume of aquifer that contributes contaminated water to the well when pumping resumes. 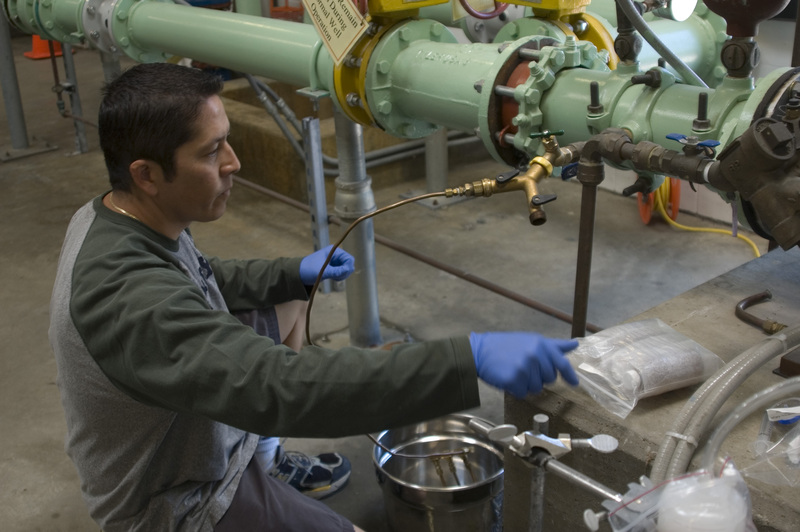 Improved knowledge of how pumping regimes affect water quality can help water managers in these and other areas of the Nation to reduce the vulnerability of water from public-supply wells to contaminants of concern. Results suggest that even in aquifers dominated by old groundwater, changes to seasonal pumping patterns and/or to depth of well completion can help reduce the vulnerability of public-supply wells to selected contaminants of either natural or human-made origin. This study was funded by the USGS National Water-Quality Assessment (NAWQA) Program. Effects of seasonal operation on the quality of water produced by public-supply wells: Groundwater, 2014, 52, Issue S1, pages 10-24, doi:10.1111/gwat.12174. Simulation of the effects of seasonally varying pumping on intraborehole flow and the vulnerability of public-supply wells to contamination: Groundwater, 2014, 52, Issue S1, pages 40-52, doi:10.1111/gwat.12150. A ternary age-mixing model to explain contaminant occurrence in a deep supply well: Groundwater, 2014, 52, Issue S1, pages 25-39, doi:10.1111/gwat.12170.